Like any form of culture, the world of gaming is neither black nor white and needs wise evaluation and this book will help readers to engage in that process. But I mentioned before that I think more space could have been given to consider how and where gaming fits within the counter-cultural call of Christian discipleship. Play is intrinsic to being human. Our family loves playing games. A life without play is a grim life. And more than a few joyless Christian responses to play and pleasure have been to view them with great suspicion. As if being spiritual equates to always being serious (and rather miserable). But would you agree that a Christian life structured around play is seriously deformed? Of course, an obsession with play is not limited to video games but is rooted deep within Western culture. Games can be deeply selfish and isolating, as well as opportunities for social interaction, fun, teamwork, learning skills and achievement. So what does the self-sacrificial way of the cross say to a culture hooked on playing games? I don’t pretend to have an easy answer to this question! Comments, as ever, welcome. This week we return to Mark 15:38 and the death of Jesus and the decisive spiritual significance of the moment of Jesus’ death as witnessed by the tearing in two of the Temple curtain. Have you (like me), always been taught that the tearing of the temple veil was the inner veil that separated the Holy Place from the Holy of Holies – and this was symbolic of the dividing wall between man and God being abolished at the death of Jesus? Reading around this a bit, its seems that this theory is pretty shaky. There was a second, outer temple curtain separating the sanctuary from the forecourt. This was in full public view when the doors were open. And, according to Josephus, this was a magnificent thick curtain, 80 feet high and portraying the entire heavens. The tearing from top to bottom of this curtain is dramatic and irreversible. It is a public sign, but of what? A strong case I think can be made that Mark has in mind here a parallel to ‘the heavens being torn open’ at Jesus’ baptism (Mk 1:9). Just as the baptism marks the beginning of Jesus’ mission, his death marks the climatic end. There is a ‘tearing of heaven’ at both. The tearing simultaneously acts as a visible sign of judgement on the temple. Jesus’ mission has been confrontational all the way through. He had already warned of the coming destruction of the temple, a fate bound up with Israel’s rejection of her Messiah. The death of the Son of God is intricately bound up with the fate of the temple. The story of Israel is not ending. But with the death of Jesus, it begins a remarkable new chapter that will change broaden and redefine the people of God. The temple stands as the nation’s great ethno-centric symbol, the dwelling place of their God. But its days are numbered. Yes, Jesus is the Messiah of Israel, but not only of ethnic Israel. As the resurrection is about to show, he is the Lord of ALL. The various authors of Halos and Avatars: playing Video Games with God want to get beyond reactive dismissals of video games as innately ‘bad’, reflecting the obsessions of loner teenage boys, representing a second-class form of entertainment and fostering violence, social withdrawal, and time-wasting. They cite research to show that the gaming generation has excellent multitasking and problem solving skills, are civic-minded and use games as a social outlet. In this light, the overall tone of this book is written by enthusiasts and is critically positive about the constructive social, educational, personal and even spiritual benefits of gaming. But here’s a thing I found especially interesting. The best games create space for mystery, possibility, openness and pose ethical and strategic demands on the gamer. Numerous games raise ethical, theological, competitive, philosophical and artistic questions – demanding much of the players and raising questions of free will and determinism. Explicitly Christian games with heavy-handed agendas (like Left Behind – yes, you’ll be glad to know that there is a game for the book series!) – are not that much fun, placing less faith in their audience, controlling the outcomes and marking boundaries. What lessons for church life, discipleship,teaching and Christian education in general here? What implications for evangelism and apologetics? Life is complex, wisdom is needed. ‘Faith as neat formula’ with easy answers may satisfy in the short term but does not cut much ice over the long haul. Often the sheer busyness of local church life leaves little room for discussing and thinking about the sorts of ethical, theological, artistic and philosophical questions that daily life throws up. One thing we’ve found really helpful in our local church is giving space for questions and having open forums. Or for having that sort of space in smaller home groups. I’ve been reading a bit more on stuff related to this post and plan to write a bit more on one fascinating article in particular which suggests that evangelical churches are good at relating to people in the early stages of faith, but tend to be poor at helping people through a faith journey that covers different stages of belief. And this has been linked in research to the fact of long-established Christians becoming ‘leavers’ from churches that preclude exploration, questioning and doubt since growth and maturity in faith can’t actually happen without such things. What’s your experience of being encouraged and given ‘space’ to question, doubt, explore and rethink what it means to be a Christian? And how has this process impacted your ‘faith journey’? Continuing our simple Sunday reflections in the Gospel of Mark and specifically within the climax of the passion narrative. 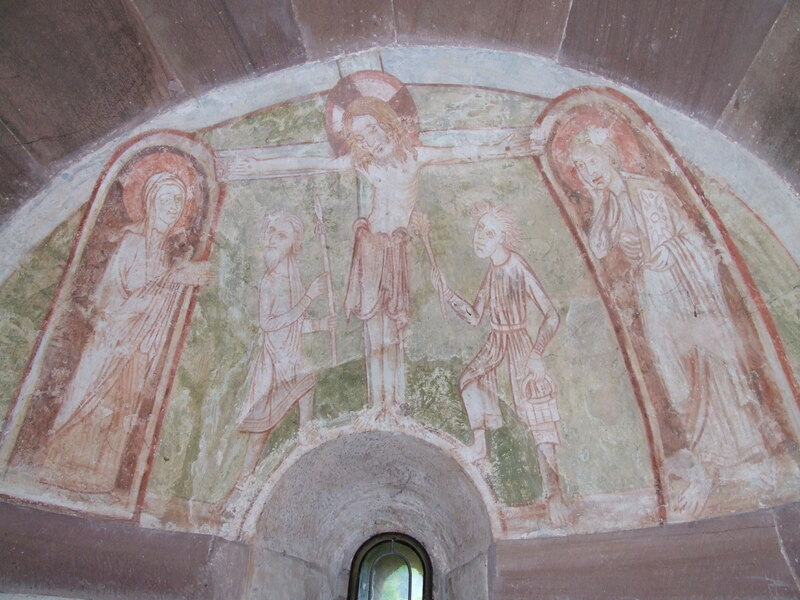 The fresco from the Kloster monastery in Alpirsbach shows Jesus being offered the drink described in this text. Jesus approaches his inevitable death: the slow agony of crucifixion, the struggle for breath, the heat of the sun, blood loss and trauma from multiple injuries, desolation at his Father’s absence have all taken their brutal toll. No-one gets down alive from a Roman cross. At his cry of desolation the onlookers offer him a drink to moisten his mouth so he can speak, mistakenly thinking he’s making one last desperate cry to be saved by calling out to Elijah – the prophet around whom Jewish eschatological hopes swirled. Jesus’ final cry here is loud – the text has a sense of a ‘great cry’ – it is a horrible, shocking scene, filled with the finality of death. I’m just going to comment on the first of these and come back to the others in the next couple of weeks. Jesus as Son of God is the ‘red thread’ tying Mark’s view of Jesus together. His sonship is announced at his baptism; known by demons; revealed to Peter & co on the Mount of Transfiguration; disbelieved at his trial; and now finally announced by the centurion at the cross. ‘Son of God’ has reference to Ps 2:7 and Is 42:1 which allude to the kingly character and power of the Son – and thus Jesus’ baptism has overtones of a kingly enthronement. Here is God’s anointed one, but his identity is only revealed to Jesus at his baptism and is a continual source of ‘hiddenness’ and ‘secrecy’ within the Gospel of Mark. In Mark 9:2-9 – the Son of God is revealed to the disciples, this revelation is connected to the command not to tell anyone until the Son of Man rises from the dead. There is an intentional veiling of Jesus’ identity until after Easter. The ‘messianic secret’ is to preclude misunderstandings of mistaken messianic expectations ‘getting in the way’. The Son of God continues his mission towards the cross, empowered by the Spirit. What does all this suggest to you about the way God does things? What do you think is God’s attitude to games? And does your answer to that question reveal a whole lot about your theology in the truest sense? How you think and speak of God? Computer technology has a ubiquitous presence in our lives. And a huge slice of that industry is targeted on giving us games to play. The global market of technology like Playstation, Xbox and the Wii gaming consoles, computers, handheld devices, mobile phones, and the Web itself is illustrative of how deeply technology has embedded itself and ‘normalised’ gaming culture within the every-day lives of teenagers, young people and many adults. Video games like Second Life, Minecraft, Myst, Riven, Guitar Hero and Grand Theft Auto are hugely significant within contemporary culture and have devoted followings of millions of players. Subscription-based games like World of Warcraft( WoW) and EverQuest involve millions of people logging on every day to play against and with each other in vast online gaming communities. Stats suggest that 94 percent of teenage girls and 99 percent of teenage boys in America play video games. With Craig Detweiler’s children, (as with mine), Club Penguin (12 million users) was an early introduction to an ‘alternative world’ of competitive and fun encounters within a MMOG (a massively multiplayer online game). are a pervasive cultural form that both reflects and constructs the contemporary cultural imagination, serving as a primary locus of meaning making and identity formation for those born in the post-Atari generation’ (76). Do you agree with this? And does it matter? How significantly do these digital games differ from other physical games – like football, rugby, tennis, athletics, even traditional board games like monopoly or Risk where you can see and touch who you are playing against? What is your attitude to computerised games? Do you spend much time playing them or have children who do? If you work with teenagers and youth is gaming culture an issue that you’ve engaged with? And this leads to the need to develop a theology of games in general. 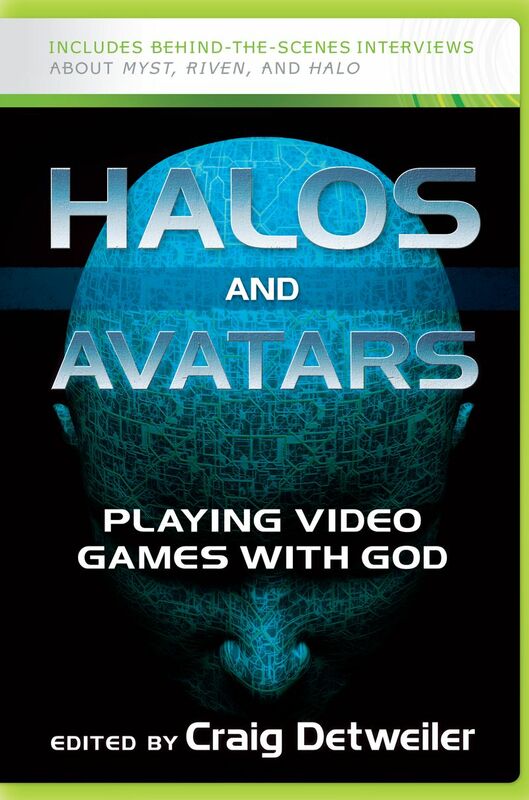 This book begins to go in that direction but I’d liked to have seen a more extended theological reflection on God and games. Which takes us back to the opening question – how do God and games go together? We’ve reached one of the most famous and most debated and most preached couple of verses in the Gospel of Mark. At noon, the brightest part of the day, the sun darkens for three hours. The darkness is a sign of the immense spiritual and eschatological signficance of what is unfolding on the cross. Darkness was associated with the original Passover, a sign of God’s judgement and of death. Does Jesus’ cry of desolation in the midst of the darkness reveal his experience of God’s judgement and of death? And in doing so his cry reveals the unfathomable depth of the passion of the Christ? Jesus’ cry echoes the words of Psalm 22:1, yet are spoken in Aramaic. I’ve heard all sorts of interpretations of these verses. – Jesus loses hope and dies a failure on the cross. Like Albert Schweitzer’s idea of Jesus as a radical but failed apocalyptic Messiah. – Jesus didn’t really feel forsaken, his cry is more an affirmation of faith in his Father looking beyond death to the resurrection. But the words in Psalm 22 are of a desperate cry for help for the righteous sufferer. Mark has made clear the impending horror of the cross and Jesus’ full awareness of what lay ahead. He has come to give his life ‘a ransom for many’. His death will be substitionary, representative and involves bearing other’s judgement for sin t0 effect liberation, freedom and forgiveness. I think we need to be cautious about how far we can press these verses to speak to the depth of trinitarian relationships between Father and Son being ‘severed’. But Jesus endures and experiences the curse and judgement of death (Deut21:23) which separates him in some awful way from the presence of his Father. The sinless one dies a death that is not his to endure. He dies your death and mine. And in doing so, his desolation is real. His pain is real. His death is real. And it is in that very historical reality that Christian hope is rooted. One of David McWilliams’ best posts about the insanity of globalised unregulated institutions that we call casinos banks. And of course there are profoundly spiritual issues here that David McWilliams doesn’t focus on. He doesn’t say it but sure implies it – at the heart of the problem quite simply is the love of money and subsequent destructive unaccountable selfish greed. A while ago I wrote a guest post here about ‘When is enough enough’? trying to argue that a Christian perspective on money and wealth should begin from a foundation of cautious distrust of its corrupting power in stark contrast to our contemporary western capitalism’s idolisation of money, wealth and the status it brings. This is hardly the type of far-sighted leader that we should be depending on, nor the opinion we should be worried about. Has he become the arbiter of economic policy in the early 21st Century? Is this where we have got to? The young lad in London who is “shorting” the European bond market mightn’t easily find Florence on a map and his geopolitical interests might not go further than the price of a footballer’s transfer fees in the closed season and who won ‘The X Factor’. … We are seeing a battle for power between the interests of the banks and the interests of the people. For years, the proponents of free capital movements argued that the markets were disciplining government and that in order to safeguard people’s money the financial markets should be allowed to do what they wanted. As a result, the banks have become so powerful that they know they can push governments around and if they fail, they will be bailed out. So it is a one-way bet with other people’s money. The big lie is that an overly powerful financial market populated by greedy people is an essential ingredient to capitalism or to democracy or to creating a civilised world for people to live in. … The big lie is that the world needs trading floors in large investment banks and the like. It does not. In fact, if you examine the period when banks were policed properly and regulated from 1945 to the mid-1980s, there were hardly any financial crises. However, since the great deregulation of banks and capital there have been dozens of crises. Deregulated banking and the financial casino makes the world more volatile not less volatile. And yet we are told, by intelligent people, that the free movement of capital makes the world more stable. This is nonsense. Don’t get me wrong, “normal” banking is necessary; the financial casino is not. The financial casino with money sluicing around the globe at its behest, giving the thumbs up or thumbs down to governments and companies, is making the world more dangerous. It should be policed. The way forward is to keep the banking part and shut down — or at least reduce dramatically — the power of the casino. …. all that banking requires is the human component. It calls for judgment; it is more of an art than a science, which is why the great bankers of the past were the ones with the best personal relations, the ones who could assess risk and not take such big gambles and obviously the ones who protect wealth first, rather than squandered it. Many of the finest bankers were Italian Renaissance men, gifted in arts and culture. Therefore, good banking comes down to good people taking in some people’s money for safe-keeping and using that money to finance investments of others who want to build new companies or seek out new investments. It really isn’t that complex. To the extent that there are innovations in banking, these innovations, like innovations in any industry, should make money safer. But in many cases innovations in recent finance have made money less safe…. The finance industry is the only industry where so-called “engineers” make the basic product less safe, not more safe. At the end of this crisis, the captains of the universe in the major banks have to be brought down to earth, just as Roosevelt did to the bankers in the 1930s. Economies will recover and the banking hegemony will be regarded as an anachronistic episode of history. Otherwise the chaos will continue.